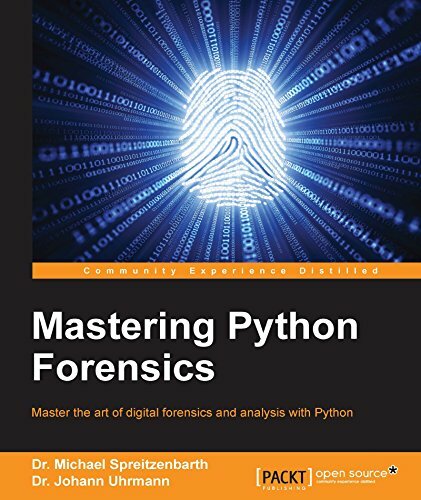 If you are a network security professional or forensics analyst who wants to gain a deeper understanding of performing forensic analysis with Python, then this book is for you. Some Python experience would be helpful. Digital forensic analysis is the process of examining and extracting data digitally and examining it. Python has the combination of power, expressiveness, and ease of use that makes it an essential complementary tool to the traditional, off-the-shelf digital forensic tools. This book will teach you how to perform forensic analysis and investigations by exploring the capabilities of various Python libraries. The book starts by explaining the building blocks of the Python programming language, especially ctypes in-depth, along with how to automate typical tasks in file system analysis, common correlation tasks to discover anomalies, as well as templates for investigations. Next, we'll show you cryptographic algorithms that can be used during forensic investigations to check for known files or to compare suspicious files with online services such as VirusTotal or Mobile-Sandbox. Moving on, you'll learn how to sniff on the network, generate and analyze network flows, and perform log correlation with the help of Python scripts and tools. You'll get to know about the concepts of virtualization and how virtualization influences IT forensics, and you'll discover how to perform forensic analysis of a jailbroken/rooted mobile device that is based on iOS or Android. Finally, the book teaches you how to analyze volatile memory and search for known malware samples based on YARA rules. This easy-to-follow guide will demonstrate forensic analysis techniques by showing you how to solve real-word-scenarios step by step.